Red Cross volunteers Tracy Lesiak and Dean Richardson look over a map of Evergreen Village in Sycamore during a second consecutive trip to hand out cleaning supplies and disaster kits to residents on Wednesday, April 24, 2013. 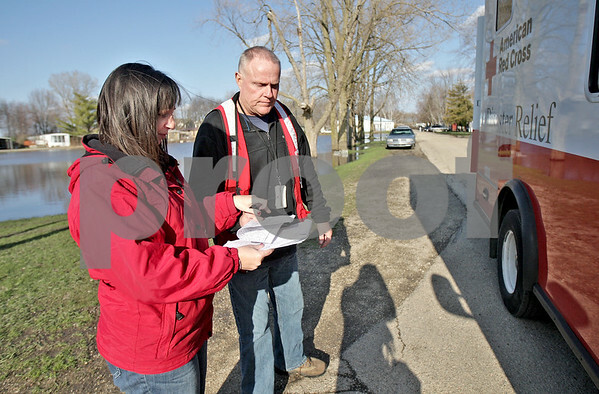 The DeKalb County Red Cross Disaster Action Team estimated some 300 items were handed out to the residents of the approximately-160-trailer community that was recently flooded due to heavy rains last week. Among the items were trash bags, shovels, rakes, tarps and gloves. The Red Cross plans to visit the community again on Thursday to distribute water.